Discussion in 'Frontpage news' started by Hilbert Hagedoorn, Oct 24, 2017. What PCI-4 do we have today? All dreams. Hey, at least we now know PCI-e 4.0 isn't that far away. Maybe the intel Z370 chipsets are already capable ? Just a next gen CPU away ? Ryzen refresh or Ryzen 2? FYI, MS just released the new version of Windows 10 Pro for Workstations, and it supports Optane RAM as well as SSDs. So maybe alongside PCIe 4.0 we will see that as an option as well in whatever super expensive chipset they sling at us next. Note, the speeds on the PCI bandwidth graph are the theoretical bandwidth in BOTH directions combined, actual bandwidth is less than half what they specify. 900P is not PCIe 4.0, it is PCIe x4 (3.0). In random workloads it crushes the Samsung drive. It totally felt like this would just be a typo (PCIe 4.0 vs x4). Its super funny how the typo in some random webshop results in someone fabricating some article like this. Disks operations hardly hit 500k iops (up to 440k on 960 anyway) and you can easily have 4x960 in raid for same price that would demolish this optane card in both speed and iops. Except, you're capped at maybe two Samsung drives unless you're using a X99/X299/X399 board. The latency and sustained transfer rates should also be much faster on there Optane drive. Holy mother of price. Didn't they say that it was going to have decent price/GB or is my memory misleading me? Are Intel's SSDs worth the ridiculous price premium over other brands? Much like the rest of their products? Yes, but not for everyone. > Disks operations hardly hit 500k iops (up to 440k on 960 anyway) and you can easily have 4x960 in raid for same price that would demolish this optane card in both speed and iops. You have a fundamental misunderstanding of how SSDs operate in practice. The specs you are quoting are for QD=32. In actual use, you're lucky to exceed a queue depth of 4. Most IO's are QD=1. 960 PRO's QD=1 rating is 14,000 IOPS, and that spec does not scale with RAID. Optane's response time is in the ~10us range, which works out to ~100,000 IOPS *at QD=1*. the only problem of Intel Optane is the Price!!! 960Pro is about 55MB/s @4K QD1 , Intel P4800x 255MB/S . is or not 5x ? What will he give me? Oh so optane does indeed drops even farther the average seek time on the files ,then for sure it is snappier although at this price ... i want to keep my kidneys ! 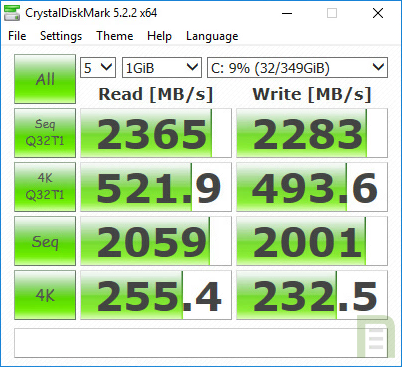 My main reasoning for ssd is that even a sata one is enough in most cases or if you just want a snappy system sure read speeds help but the juice is on the seek time that from the hdds to ssds it dropped 10-100 times! Goes with out saying that ofc there are specific work loads that benefit from raw read and write speeds i am not going specific here !